Even though we had thoroughly recharged our batteries over Easter and only been back at work for four days (three if you discount the INSET day – which of course we DON’T), it was bloody lovely to get away from it all to the second, and hopefully annual, ResearchED Scandinavia in Norway. Having loved the warm welcome in Sweden last year, I wasn’t going to miss this one. 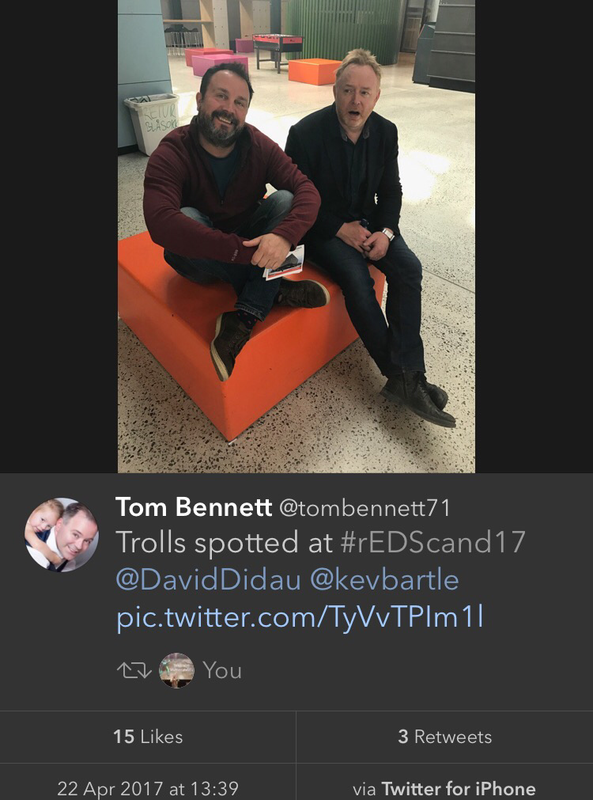 Every time Tom Bennett welcomes us to a ResearchED event he begins with the joke that we must be mad to give up our Saturdays for educonferencing (not that the act is getting old). ResearchED Scandinavia is a welcome opportunity to switch into educational ‘flight mode’. Or perhaps, more to the point, to get out of the pilot’s seat (be it your classroom or your school), fasten your seatbelt, cruise at an altitude way above the normal worm’s eye perspective, and get to see distant horizons unfold before your eyes. On Friday night, shortly after arriving, we popped out to a pub, The Scotsman (in honour of Tom who was elsewhere), and ordered two drinks. The bill was 230 Norwegian Crowns (I love it when they anglicise the name of their currency), which translated to about £22. If you ever come to Norway, you might want to consider taking out a second mortgage. If you plan on staying here for a fortnight, selling one or two of your more high profile organs might be advisable. But don’t sell your heart. Apart from the fact you’ll need it to survive, you’ll also need it for when you fall in love with the place. Beautiful public transport, breathtaking landscapes and wonderful people are in abundance. In fact, the only thing that wasn’t figuratively “to die for” were the all-butter croissants: and when I say all-butter, I really do mean it. We struggled to find the pastry! On second thoughts, maybe they were literally to die for and the heart harvesting might have been an idea after all! Norwegian new builds outdo even BSF ones in the U.K.
We were warmly welcomed by the Principal of Kuben yrkesarena (the Kuben vocational arena), which is an astonishing building that is currently in the middle of an abandoned industrial estate that is about to be razed to the ground and replaced by an enormously ambitious community complex. The commitment to regeneration was everywhere we looked in Oslo. Cranes dominate the landscape in the city centre but also in the suburbs. I don’t know anywhere near enough about the place to comment with expertise, but I rather got the sense that the same forces that make alcohol expensive are also the ones that keep wages high and, thereby, taxation sufficient to power these regenerative efforts. As I found out later in the day from two British teachers who had settled in Oslo and married Norwegians, the quality of life meant that they had no thoughts about returning. Having witnessed first hand just how much effort goes into the organisation of these days (and just how nonprofit they are) my tongue was firmly in my cheek, and I think I’d rather miss the democratising nature of the hashtag hash at the start of each event if there was an executive order banning the use of any other than the official one. In doing so, I unwittingly – or possibly semiwittingly – unleashed a stream of tweets that challenged David in his assumptions, including some that posited alternative academic studies as evidence against this. That’s a form of professional peer review and one that, to give him credit, David handles well. There are countless examples of this Twitterspheric turbulence at every ResearchED event (not including the non-Virtual challenges that punctuate the days themselves), and these questions and interventions are, I hope, the “grit in the oyster” from which a grassroots pearl can evolve. 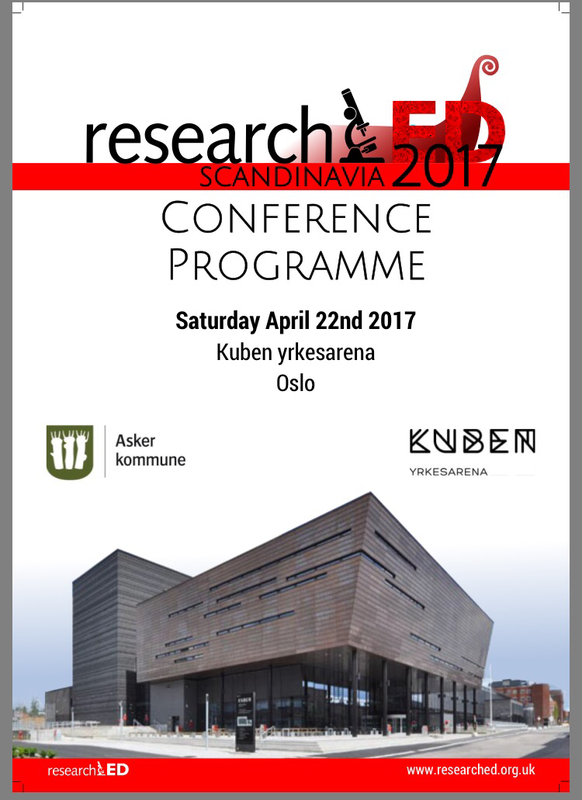 At the very least, I hope that ResearchED events continue to provoke debate, not least of all by including debate within the programme. Life, and research-informed practice, is better when it’s messy. My first session was with Tom himself, based upon the Creating a Culture document that the DfE group he chaired published recently about behaviour in schools. The comment about “how we do things here” resonated with our work at Canons, but the aspect that I really liked was the notion that both schools and the individual classrooms within schools are ‘cultures’, so much so that I took time out of one of the day’s sessions to write this blogpost about my own recent small contribution to our school’s behaviour culture and, hopefully, the microcultures of one or two of my colleagues’ classrooms. I’ve only recently rediscovered the joys of blogging for self-reflection and, perhaps, self-correction. 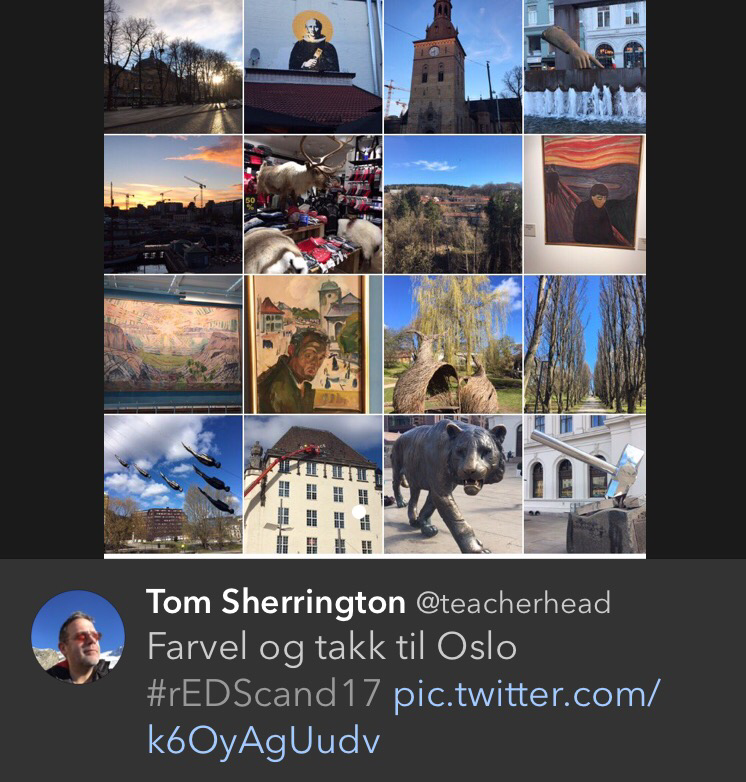 But when I look back through my almost half-decade of blogging history, it’s notable how many have been inspired by presentations at conferences such as Pedagoo, TLT and, of course, ResearchED. However jaded we might be tempted to be about these pedagogic jamborees, I would miss them greatly if they disappeared. By the time the afternoon came around, having thoroughly nourished ourselves bodily as well as intellectually, I managed to catch up with the man who some may have believed I had trolled, and all was well. We caught up with our twitter discussion about my challenges to his presentation and broke bread together. As is the way of these conferences, we also rambled on about work stuff, family lives and varied pieces of nonsense in amongst it all. 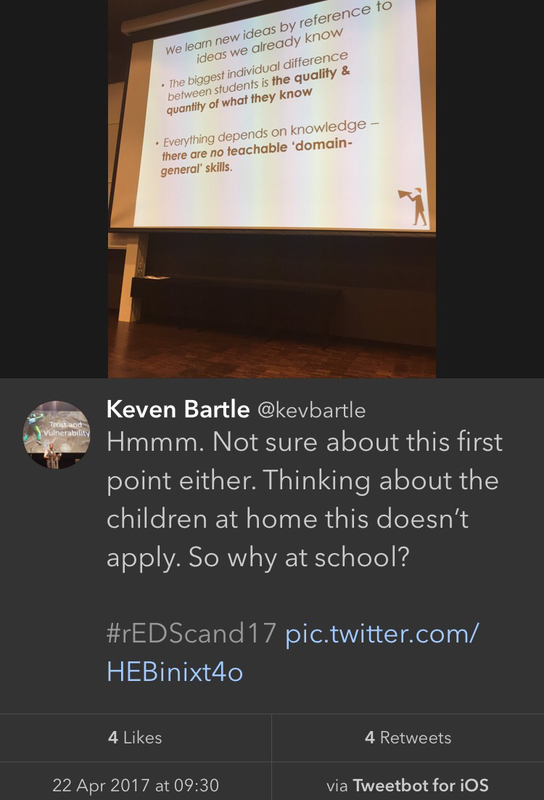 The fact that the stiletto-pointed comment was made so politely and received so warmly, not to mention liked and retweeted by a good number of Scandis, rather demonstrated the distance we UK-based twitter educators have to go: more drolling and less trolling, please! At one of my final sessions of the day, I went to see the wonderful Swedish teacher Eva Hartell, who was talking about the Teknik curriculum in her country. It looks like an astonishingly ambitious and broad programme, one that would struggle with double its curriculum time, and yet more and more is being added to it all the time by polichmakers (sound familiar?). She spoke English beautifully even though she sometimes seemed frustrated by her failure to grasp occasional words to fully express herself. Thus, not only do I admire her (and all the presenters who spoke for fifty minutes in an alien language, when I mastered nothing more than ‘thank you’ in Norwegian), but also for her humility. Whilst I have huge respect for Scandinavians for grasping our language so wonderfully, one of the recurring themes of the day is the potentially very negative impact of their governments’ rush to grasp our accountability-heavy, agency-stifling educational reforms. That this is happening even in the historically autonomous Norwegian system, was made clear in the wonderful presentation given by Tine S Prøitz. I wish them well in continuing to blend professional and academic integrity in order to keep the wolves from the door, and the policy trolls from the classroom. And so we came to the end of the day: one that had given me so much to think about, so much to enjoy and so much to tweet about. Someone even came up to me and, notwithstanding my republican beliefs, bestowed upon me a regal epithet. I shouldn’t worry though. Given the meal that our hosts had organised back in the town centre, and the numerous drinks that accompanied it, I found myself very much as a king without a Crown: but at least no second mortgage or laparotomy either. 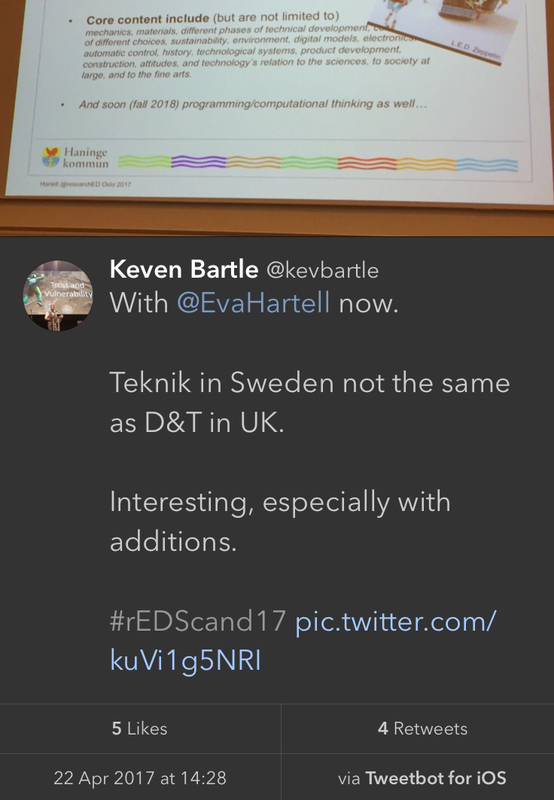 And just to prove that I have no royal ambitions, I’ll leave the last twitter words of this post to two educators, one English and one Swedish, to show (in spite of those who criticise) just how important ResearchED Scandinavia 2017 was, is and will be in bringing people from different domains together in search of a more research-informed, cross-cultural teaching profession.